Dappled sunlight filters through arching mahogany trees on the road winding up to this 400 acre plantation estate with a long rum-making tradition. 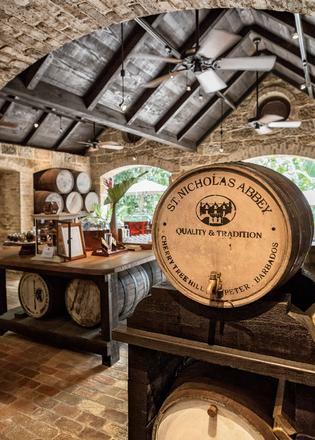 Known for its meticulously restored Jacobean style mansion built in 1658, St Nicholas is also celebrated for its traditionally distilled rum. The elegant high-ceiling tasting room overlooks the terrace and gardens, where birds trill in avocado, breadfruit and royal palm trees. I am greeted by Simon Warren, whose father, the architect Larry Warren, bought the property in 2006 and restored it to its original glory. The family oversees the entire rum production, including cultivation of sugar cane, fermentation, small batch distillation in a pot still named Annabelle, aging in bourbon oak casks and bottling by hand in glass decanters etched with an image of the historic mansion. The tasting: I begin with a clear and golden five-year-old vintage made from the abbey’s own white rum – the only rum produced in Barbados from cane syrup rather than molasses. Wildly fruity notes on the nose lead to mocha coffee, vanilla fudge and white pepper. Darker in color, an 18-year-old single cask vintage follows, offering a whiff of tobacco and fresh pine needles, smooth zesty orange notes and a long silky finish. “It’s smooth enough for a lady and strong enough for a man,” says Warren. 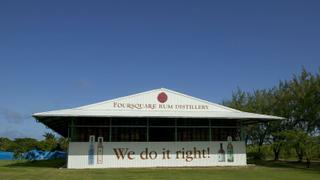 On the pastoral southern slopes of the St George Valley, this iconic distillery, renowned for its ultra-premium rums, sits on a former sugar plantation dating back to 1636. At the center of the enterprise lies Richard Seale, whose perfectionist approach to blending and maturation expands the tradition started by his great grandfather, who founded the company in 1926. The distillery produces multiple brands, including Doorly’s, Old Brigand, RL Seale & Co, the Real McCoy, Foursquare Spiced Rum and special projects such as Foursquare Exceptional Cask Selections. A personal tour of the grounds includes a visit to the original 18th century colonial buildings, folk museum, sculpture garden and the modern distillery that utilises both an artisanal copper pot and a traditional twin column coffey still. In the cool private tasting room, a selection of rare offerings are arranged on the polished wood table by Richard’s wife, Gail. The tasting: I start with the deep and dark colored Port Cask, aged three years and six years in bourbon and port casks respectively; it imparts a scent of ripe fruit with brown sugar and vanilla. Up next, Zinfandel Cask, aged 11 years, adds an oaky wine characteristic to a dominant rum aroma. Continuing, the deep gold color of Foursquare 2004 balances vanilla, cinnamon, ginger and ripe tropical fruit flavors. Finally, Foursquare 2006 – winner of the 2016 IWSC Rum of the Year award – gleams deeply with lively aromatics of dark sugar, mango and banana. Island celebrity and flamboyant master mixologist Philip Antoine presides over the bar at this chic lounge and dining hotspot on the island’s west coast. 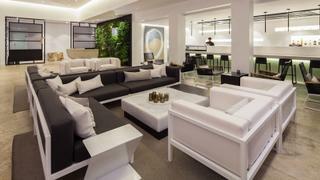 A private elevator transports guests to this penthouse aerie located in the Limegrove Lifestyle Center, which is filled with boutique shops and familiar favorites such as Cartier, Louis Vuitton, Chopard and Bulgari. A selection of island spirits, including Mount Gay XO and Doorly’s from the Foursquare Distillery can be sipped at the polished white stone bar or while lolling on streamlined black and white couches, with soft Ibiza lounge music playing calmly in the background. My bartender, Orwin Findlay, crafts a perfect 1996 – a rum-based specialty created by Antoine to celebrate the 50th anniversary of Barbados’s independence and one of the quirkier rum cocktails that every superyacht bartender should know. It’s a mix of Mount Gay XO, house-made spice syrup and lime, shaken, served in a coupette and covered with a foam of pale yellow passion fruit and vanilla, garnished with a thin line of grated dark chocolate. “We keep it simple and different. It’s a bit tart and smooth with a hint of sweetness,” says Findlay. The newest addition to the property is a spacious, walk-in cigar humidor. 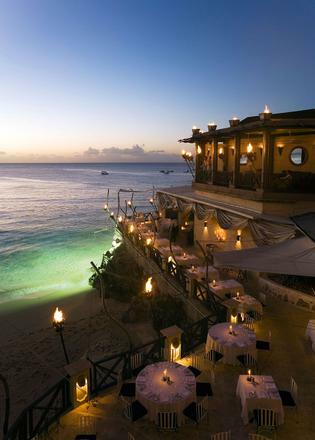 Choose from dozens of Cuban cigars, including vintage choices such as a 2000 Cohiba Piramides. 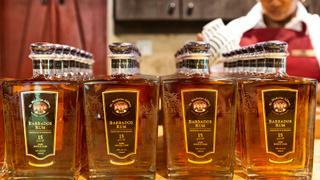 Vintage spirits include whisky, cognac and, of course, rum, such as the limited-edition Mount Gay Tricentennial.